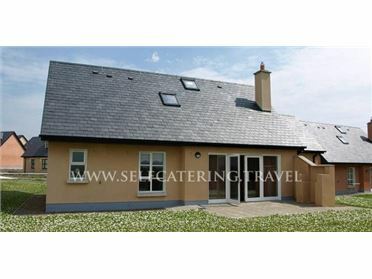 Curris Cottage is a single-storey detached cottage in a rural setting a couple of miles from Kilcar in County Donegal. The cottage has two double rooms, one with an en-suite, and a room with triple bunks (double below, single on top). There is a bathroom, a kitchen with dining area and a siitting room with woodburning stove. Outside is ample off road parking, and a garden along with use of the owners' field for picnics. Curris Cottage is within walking distance of a beach, and is in a region bursting with local flavour, sure to send you home with a taste of the 'real' Ireland. The village of Kilcar is a peaceful village in County Donegal. The village sits in an area of natural beauty with spectacular views afforded at Slieve League Cliffs as well as one of the beaches on Muckros Peninsula ideal for surfing or bathing. Oil central heating with woodburning stove. Electric oven and hob, microwave, fridge, washing machine, dishwasher, TV with Free-to-air channels, DVD, CD/radio, selection of books and games, WIFI. Fuel, power and starter pack for stove inc. in rent. Bed linen and towels inc. in rent. Cot and highchair. Ample off road parking. Lawned front garden. Two well-behaved pets welcome. Sorry, no smoking. Shop and pub 2 miles. Beach 1 mile. Note: Property is surrounded by farmland, dogs to be kept under strict control..